Prior to surgery and post operatively it is important to strengthen the muscles of the leg and to reduce the stiffness. Regular exercises should be undertaken to do this. Static quadriceps exercises consist of tensing the muscle on the front of the thigh whilst the knee is straight. Hold the contraction for 5 to 10 seconds, rest for 5 or 10 seconds and begin again. This should be repeated 10-50 times. Whilst lying on your back the straight leg should be lifted into the air and held for 5 to 10 seconds, then lowered rested for 5 to 10 seconds and repeated 10 to 50 times. If possible these exercises should be undertaken against weight or resistance or in a gym using exercise equipment. Anti-inflammatory tablets (Indomethacin, Voltarol, Brufen, Naprosyn etc) should be stopped 2 days before surgery. On the morning of surgery patients should fast from midnight and arrive at the hospital at 7.20 am. For afternoon surgery you will be fasted after 8 a.m. Prior to the operation any tablets or medications you take, or allergies you may have to medications, should be brought to the attention of the surgeon. Please notify your surgeon and anaesthetist in advance if you are taking any anti-coagulants (blood thinners), hormone replacement tablets, the Pill or suffer from diabetes or any other significant medical condition. The anaesthetist and Mr. Johnson will see you before surgery. The operation is performed under spinal or general anaesthesia. There will be one or two small incisions in the front of the knee either side of the patellar tendon. These may be closed with a steri-strip or single suture. Following the operation patients usually wake up with a brace on the leg and a continuous passive motion machine that is designed to gently move the knee even while you are asleep. This is used to maintain a range of mobility in the joint to speed your recovery. A removable knee splint may be used to support the knee during the recovery period. A general anaesthetic is generally used. Sometimes a spinal injection is preferred. A tourniquet is usually used and routine prophylactic antibiotics are administered. Through small 5 cm incisions either side of the patellar tendon below the patella. The arthroscope (telescope) is inserted into the knee for a thorough inspection of the knee. 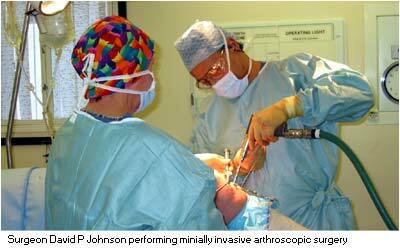 Through the other arthroscopic portal a mechanised shaver of approximately 5 mm in diameter is inserted. This is used to elevate the fat pad from the non articular inferior pole of the patella. Then the inferior pole and the overlying tendon can be identified. Using a small mechanised burr the inferior 5 mm tip of the patella is excised thus decompressing the affected area of the tendon on the deep posterior aspect of the tendon. 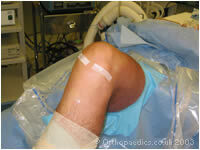 Irrigation of the knee is undertaken to remove the debris from the knee. The wounds are closed with a simple steri-strip or single sutures and a wool and crepe bandage is applied. Patients can generally mobilise full weight bearing, can be discharged as a day case procedure. Full weight bearing can be allowed without crutches, splint or plaster cast. The patient can usually return to office type work in 3-5 days and driving soon afterwards for short distances. For the first 3 weeks very little formal physiotherapy is necessary. Patients should gently move the knee so as not to get stiff but should otherwise rest as far as possible. Anti-inflammatory medication should be continued during this time. Regular icing of the knee should be undertaken to reduce any swelling of the knee. After the 3-week period clinical review is undertaken by Mr. Johnson. After three weeks active flexion and extension exercises and static quadriceps exercises can be started. However resisted through range extension exercises are to be avoided at this stage. Light work and more manual activity can be undertaken at this time. After 6 weeks it is usual to return to static cycling, gentle swimming and non-impact gym exercises. Resisted knee extension exercises should be avoided until 6 weeks following surgery. Jogging on the flat surfaces may be restarted after 9-12 weeks depending upon the rate of recovery. Analgesics and anti-inflammatory medication are usually necessary for between 3 and 6 weeks following surgery and are helpful when returning to exercise or sports. The results reported by Mr. Johnson show that 94% of patients have been improved following this sort of surgery such that sporting activities can be resumed. The crepe bandage which is applied in theatre may be removed overnight if the wound is satisfactory. This should be replaced by a tubigrip type bandage, which may be removed at night. This is usually continued for a week or so.